Want to pay by check? Here's the form. Bicycle helmets can help prevent serious injuries to children and adults. The Montana Trial Lawyers Association distributes nearly 1,000 bicycle safety helmets to children around Montana each year. MTLA has given away over 9,000 bicycle helmets in the past ten years to children in grades K-8 throughout Montana. Here are a few of the reasons for this program. 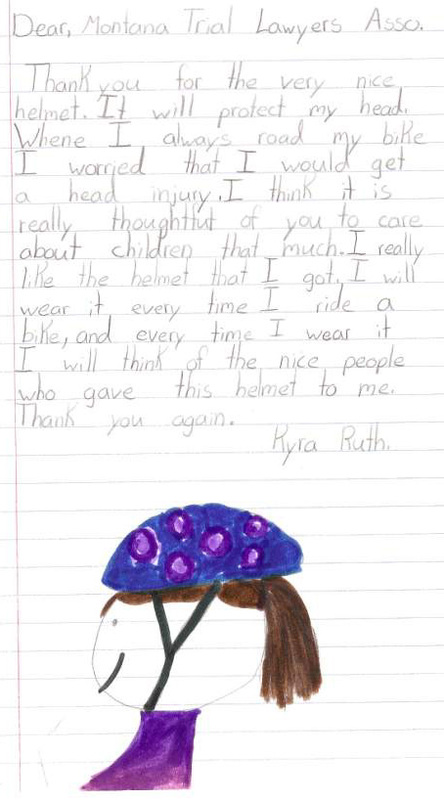 We cannot provide enough helmets to fill all the needs in Montana, if you would like to help us provide more helmets for MTLA's Bike Helmet Program, please make a contribution. Thanks to Bell we can purchase helmets for about $10.00 - a little money goes a long way with this program! Our thanks to Bell Sports for giving special price breaks on bike helmets for this program and to our MTLA members who have contributed time and money to this program!